College football starts tonight (Go State!) and within the coming weeks the NFL and NHL will start their seasons as well. This month, I want to ask where you go to watch a game if not at home? There are a few options in downtown to take in the plethora of games on a weekend day but the atmospheres are completely different. Where do you most enjoy to watch sports? Is it at a sports bar or any restaurant with a TV? Make sure to vote and leave a comment. Being a Penn State and Pittsburgh Steelers fan, Oh Mulligans and Sammy’s get my vote. Hi Leo, The Triangle Penn State Alumni Chapter meets at Oh Mulligans in Morrisville. It’s where I would go even if there weren’t rabid Nittany Lions in the room. 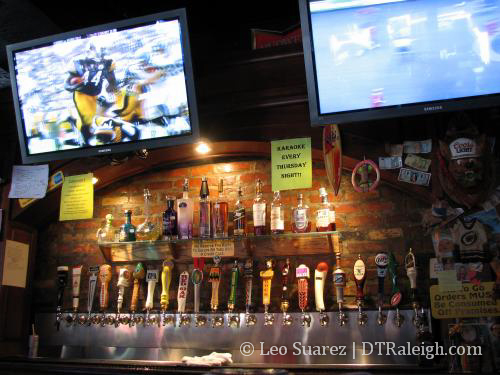 Woody’s at City Market (the one in the pic) is probably the best sports bar in Raleigh. The Brickhouse is also a pretty good sports bar. I’ll 2nd the Woody’s nomination. I know it’s new (and I’m okay with this), but I favor Tobacco Road for the afterwork sports spot. Their food (e.g., nachos and wings) is quite good, as far as sports/bar/food goes, and their Happy Hour food deals from 4-6 make it well worth the going to Glenwood South. Their beer selection ain’t too bad neither. I have to say that I am biased since my husband is one of the owners, but I still think I’d prefer Tobacco Road even if we weren’t associated with it. We used to look for places to watch the game around downtown and usually ran into the following: poor service, average food at best, and/or places that wouldn’t have the sports packages that we wanted (or the staff just wouldn’t care very much about putting the game on that we wanted). Tobacco Road truly was created by sports fanatics and with sports fans in mind. There are flat screen TVs everywhere and our goal is to deliver great food and service. Also, the guys are extremely knowledgeable and passionate about sports. I have to vote for Hibernian, since it’s the only downtown bar (that I’ve found so far) that shows the sport I want to watch – soccer! But even that isn’t as good as just DVR’ing the games and watching at home. Time differences between here and Europe mean that a lot of games come on way too early to watch live! Hi-5 got my vote for downtown places. In North Raleigh, I’ll frequent a Carolina Ale House or Falls Tap Room. As a _NC_ State grad, I’m going to have to say Sammy’s if you don’t mind college kids. You’ll get the full force of testosterone on a game day by going there. For games in general I’m going to have to say the Draft House in Cameron Village. For downtown if I go to watch a game you’ll find me at Hibernian. Mostly because it’s the only place where you can be comfortable enough in numbers watching a soccer game. I recently moved to Raleigh and am a Clemson grad/fan — are there any Raleigh/Traingle Clemson Chapters that meet to watch the games? Alicia – you mentioned ‘The Alley on Hillsborough’ is this the full name – where are they located? I found some information – thanks! I was at Smokey Bones the other day and saw the greatest invention I have ever seen! It was a football field goal post with a football attached to urinal screen in the urinal and it was genius! Guys aim at it while relieving themselves. You have to see it yourself, the website of the company that makes them is at http://www.direct-aim.com and every sports bar should have these!